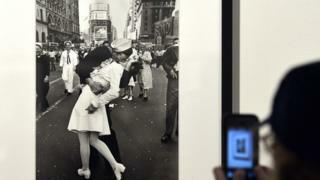 The US sailor famously photographed kissing a stranger in New York’s Times Square to celebrate the end of World War Two has died aged 95. The picture of George Mendonsa bending over and kissing 21-year-old Greta Zimmer Friedman on VJ Day (Victory over Japan) became one of the most enduring images of the period. Ms Friedman died in 2016 aged 92. Mr Mendonsa’s daughter, Sharon Molleur, said her father suffered a seizure and died on Sunday after a fall at a care home in Middleton, Rhode Island. “I was running ahead of him with my Leica looking back over my shoulder but none of the pictures that were possible pleased me,” he wrote in the book Eisenstadt on Eisenstadt. Mr Mendonsa had served in the Pacific and was on home leave when the picture was taken. However, not everyone sees the photograph as something to celebrate. Although it was widely lauded as an expression of the joy felt across the US on the day Japan surrendered, in more recent times some have considered it, as Time Magazine wrote, “as little more than the documentation of a very public sexual assault”.